(Newser) – Mitt Romney will be sworn in as a US senator on Thursday—and he makes it clear in a Washington Post op-ed that he has no intention of becoming an unquestioning ally of President Trump. Romney writes that Trump was not his choice to become the GOP nominee for president and while he hoped Trump would rise to the occasion, "his conduct over the past two years, particularly his actions this month, is evidence that the president has not risen to the mantle of the office." Romney says that while he agrees with some Trump policies, Trump has failed to unite or inspire the nation as a president should. "With the nation so divided, resentful, and angry, presidential leadership in qualities of character is indispensable," he writes. "And it is in this province where the incumbent’s shortfall has been most glaring." Trump's words and actions, he writes, have caused worldwide dismay. HA!HA!HA! Mitt Cuckney complaining about Trumps character; look who's talking. One of the most important elements of Character, is keeping one's word. Trump has, unlike virtually all other successful politicians, kept his campaign promises to the voters. 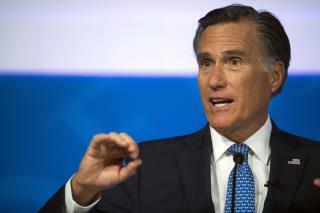 Whereas, Romney is as good as whatever his word happens to be, at the moment, for a moment. Romney is a hater because he couldn’t blast to the 270 (like Trump did on election night vs Hillary). Instead, obozo beat him down. Pathetic! !